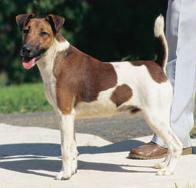 The gentry and working class alike owned Fox Terriers. During the hunt, when the fox went to ground, Fox Terriers (which were carried in saddlebags on the horses) were brought up and sent in after the fox. Their job was to chase the fox out of its lair so the hunt could recommence. They were not required to kill the fox because if they did the hunt would be unable to continue. The working class also bred these dogs to keep vermin down – a job they excelled at and which also provided much sport. This fearless little dog normally lives to 12 years, but can live up to 14 years of age when given plenty of love and attention and fed the right nutrition. The Fox Terrier is happy, fearless, a clown and a devoted friend. A Fox Terrier requires a lot of company, plenty of exercise and preferably some time for relaxation. In return your Foxie will give you undivided loyalty. When walking your dog, always have it on a lead. Fox Terriers can be very single-minded when they see something of interest, perhaps across the road and will chase after it – often with disastrous consequences.There are two types of Fox Terrier – one with a wire coat and one with a smooth coat. The wire coated variety has a harsh wiry jacket which requires a lot of attention if the dog is to be kept looking smart. The coat needs to be clipped into shape about four times a year, combined with regular brushing. Being intelligent and independent, a Fox Terrier pup is likely to be mischievous and may wander off to find its own fun if you do not have a secure yard.